What The Forecast?!! has just won a 2018 Webby People's Choice Award in the Mobile Sites & Apps - Services & Utilities category!! What The Forecast?!! 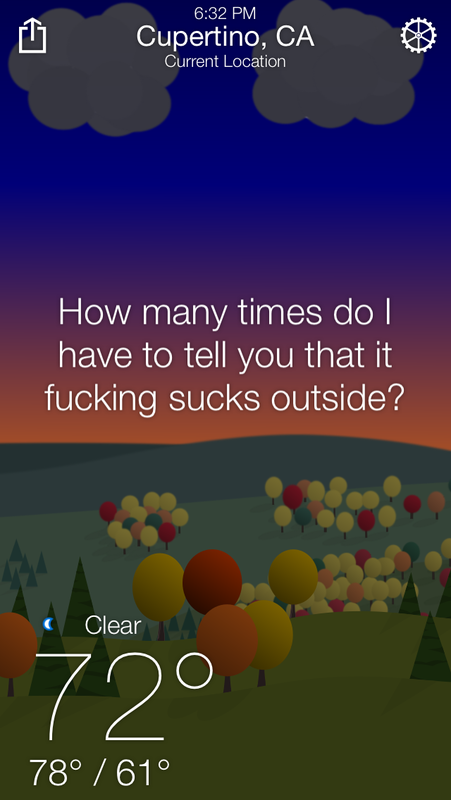 is an accurate weather app that will explain, in real terms, how nasty it is outside. You will never again wonder if you should just go back to bed (which, of course, you should). Sometimes, it is better to just give up and try again tomorrow. - Over 8206 obnoxious phrases describing the current weather conditions. - Listen to the latest weather saying in different voices. - Accurate weather reports directly from AerisWeather. - Daily forecasts for 10 days. - Hourly forecasts for 48 hours. - Weather alerts from NOAA. - Backgrounds and precipitation that match the time of year and current weather conditions. - Select from U.S. or metric units in the app Settings. - Descriptions of basic weather terms used in the app. - Share your weather reports on Facebook, Twitter, etc. **Make sure you go into the What The Forecast?!! app settings and set the profanity setting to "On" for the full effect. You won't be disappointed (Or, maybe you will. I don't know you...).